Carrie Parker is nine years old and is trying to cope with the fact that she and her mother, Libby, have been forced to begin a whole new life in a new town due to the violence that shattered their family not too long ago. Carrie and her mother live in a cheap motel room, and while Libby works during the day Carrie is directed to stay in the room and not even think about leaving. But when she breaks her mother’s rule to scavenge for food at the salad bar at the local Wendy’s, she meets Cricket Chaplin and her mother, Honor, and she couldn’t be more smitten with their seemingly beautiful, rich, and perfect family. She and Cricket bond immediately due to the fact that they both lost a sister, and although Cricket’s family treats Carrie like one of their own, it is their love and attention that is the catalyst for Carrie’s family secrets to come to the surface. But the Chaplins have secrets too, and as new truths come to light, these two families will be changed forever. Years ago I read the haunting, tragic, and beautifully written Me & Emma and absolutely loved it. So I was thrilled to discover that Flock has written its sequel in What Happened to My Sister. And I have to say, this novel is a welcome addition to Carrie Parker’s story. If you haven’t read the first book, you can still read this one absolutely, as the major plot points of Me & Emma are rehashed in the first chapter or so of this book. But if you can, do yourself a favor and read both books – they really are that good. Flock is a talented writer who knows how to bring her characters to life. As I was reading this novel, my heart truly ached for Carrie. The way she was living was nothing short of child abuse and neglect. It was beyond tragic to see how her mother blamed Carrie for everything wrong that happened in their lives, neglected her in every possible way, and physically abused her when all else failed. It was beyond heartbreaking to read about and when Carrie met the Chaplins my heart soared with delight that she finally would have some happiness and joy in her otherwise depressing existence. Honor Chaplin was another character I felt deeply for. She had lost a daughter, and that experience was affecting her life in so many awful ways – her marriage was in the toilet, she had to move out of her home, and she was having difficulty making sure her other daughter, Cricket was coping with her sister’s death. Meeting Carrie was a bright spot in Honor’s life, too, as she loved having Carrie around and the joy that she got from watching Cricket spend time with Carrie was truly healing for her. This book is one that will stick with me for quite a while, similar to its predecessor, Me & Emma. The ending packs such an emotional punch and by the time you get to the ending, you are so invested in these characters that it is nearly impossible to believe that the story is really over. 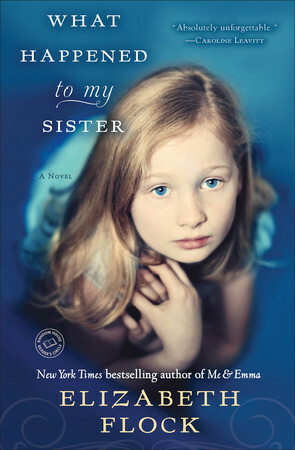 I highly recommend picking up What Happened to My Sister, but even further, reading Me & Emma first will really add to the experience. I loved them both. It sounds like this book is full of emotion. The sad thing is many kids live that way. Argh, OK, I’m going to see what my options are at the library! So I can gleefully add to the Pile That Will Never Go Away. Oh man, this one does sound powerful, and the first book is where I think I will start. I always have a hard time reading about kids who are treated badly, but something about the urgency of your review makes me think that I need to read both of these. Great job there today, Heather! I liked Me and Emma, so I must read this one as well –nice review. I STILL haven’t read Me and Emma. And I think it’s been sitting on the shelves for the past 5 years or so. I just finished this one and have to admit that I wasn’t that crazy about it, which was very upsetting to me because I loved Me and Emma. I’m still sitting here pondering what exactly it was that turned me off…..